Aegon is an international financial services company with nearly 30 million customers in the Americas, Europe and Asia. Its purpose is to help people achieve a lifetime of financial security. 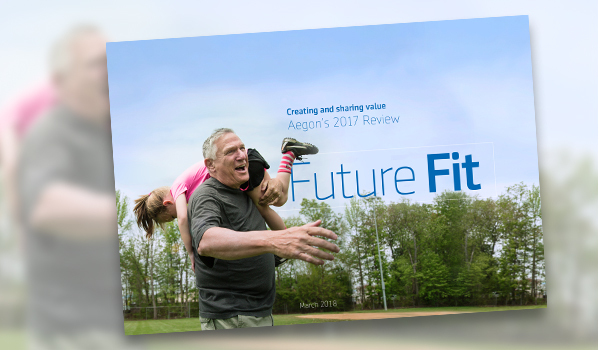 The company’s latest integrated report sets out how Aegon creates long-term value for society – not only as a provider of financial services, but also as an employer and investor. Over the past year, Aegon has seen significant change in its operating environment. Interest rates are still very low, despite recent increases in the US and UK. There’s been an increase in financial regulation, together with significant economic and political uncertainty. Society is also changing rapidly, particularly with aging populations and the spread of digital technology. In response, Aegon is adapting quickly, restructuring its businesses, expanding in new growth areas and investing in new technologies that will help bring the company much closer to its customers. Aegon’s strategy focuses on areas where it creates most value for society: in helping customers improve their financial security and well-being; in being a leader in retirement and healthy aging; and, through its investments, in helping combat the effects of climate change. This year’s Review also deals with key challenges, particularly the impact of restructuring and job losses in the financial sector, as well as the recapitalization last year of Aegon’s Dutch business. In addition, the Review provides details of the company’s commitment to paying fair taxes, investing responsibly and how it is contributing to the UN Sustainable Development Goals. During the year, Aegon paid out over €48 billion in claims, benefits and pensions, providing protection and peace of mind to millions of customers around the world. Dividends to shareholders, meanwhile, increased for a sixth straight year. Indeed, dividends have risen by 29% since 2012. Impact investments totaled more than €8 billion; this includes significant investments in social housing, international development banks and renewable energy. Green investments alone amounted to €800 million. Aegon updated its Responsible Investment Policy and announced it was stopping investments in tobacco due to the link between smoking and long-term illness. A new $100 million US affordable housing fund was launched; the fund will finance loans across 13 states and help address the current shortage of low-cost homes. Customer loyalty continued to improve; more than 60% of Aegon businesses now rank in the top half in their local markets. Thanks to investment in new technologies, 4.2 million customers are now ‘connected’, ahead of the company’s target for the year. Aegon became the UK’s leading investment platform and Transamerica announced an important outsourcing deal with Tata Consultancy Services.